For every person who would pick apple pie as their favorite, there is another person who would pick cherry as their top choice. They’re probably the two most popular pie flavors out there. I have seen many variations on apple pie over the years, but I find that I see cherry pie variations much less often. A classic cherry pie is a double crust pie, sometimes with a lattice crust over the top. 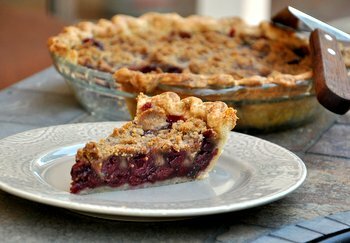 If apple pie can get a variety of flavors and toppings to mix it up, so can cherry pie, and that is what inspired the creation of this Cherry Crumble Pie. This pie has a filling made with sweet cherries and brown sugar, and is topped with a buttery brown sugar crumble topping. The brown sugar adds a certain richness to the cherries and brings out some of their darker berry notes. In the crumble, it also makes for a lovely deep brown color after the pie has baked. I added a splash of vanilla and a splash of amaretto to the filling, as well. The filling for the pie is thickened with cornstarch and there is just enough in with the juicy cherries to ensure that the filling holds together and slices cleanly when the pie is ready to be served. I used a homemade pie crust for this recipe, but you could easily use a premade (frozen) crust if you prefer not to make your own crust. The filling and the topping pack in a lot of flavor so, while a buttery homemade crust is definitely a nice finish, you can get away with using a shortcut here and still get a lot of flavor in your pie. You can also opt for either fresh cherries or frozen cherries for this filling. 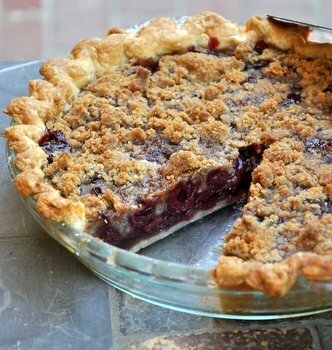 I like fresh, sweet cherries for a pie like this one, though tart cherries can make the filling really pop. If you use frozen cherries, don’t defrost them before adding them to the filling, just toss them with the rest of the filling ingredients and add them to your crust. Roll out pie dough and fit crust to a 9-inch pie plate. Chill rolled crust in the refrigerator for 30 minutes. In a large bowl, combine cherries (do not defrost if using frozen) with 1/2 cup brown sugar, vanilla extract, amaretto/almond extract, cornstarch and 1/8 tsp salt. Stir gently with a spatula to combine. In a medium bowl, whisk together 3/4 cup all purpose flour, remaining 1/2 cup brown sugar and remaining 1/8 tsp salt. 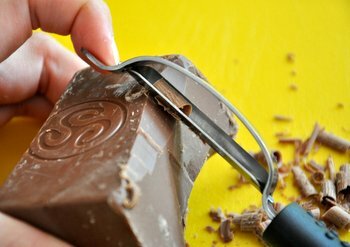 Cut butter into small pieces and rub into flour mixture until butter is well-incorporated and mixture resembles wet sand. Pour cherry mixture into prepared crust. Top evenly with crumble topping. Bake for 70-75 minutes, until the pie is well browned and the filling is bubbling. Allow pie to cool completely before slicing. Whisk together flour, salt and sugar in a large bowl. Rub in butter with your fingertips, pressing it into the flour mixture and breaking it up, until mixture resemble very coarse sand and no pieces larger than a large pea remain. Using a fork, stir in ice water until dough almost comes together into a ball. Press dough into a ball with your hands and wrap in plastic. Chill for at least 30-60 minutes before using. Mmm, cherry pie. I’ll bet this would be even better with some slivered almonds or maybe almond meal in the crumble!